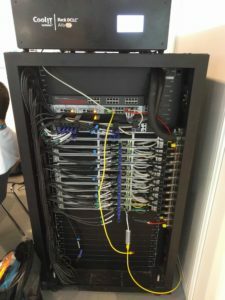 Last week, as I mentioned in my earlier post, I was in Frankfurt, Germany, for the ISC High Performance Computing conference. 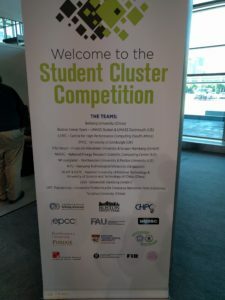 The thing that grabbed my attention, more than anything else, was the Student Cluster Competition. 11 teams from around the world - mostly from Universities - were competing to create the fastest (by a variety of measures) student supercomputer. These students have progressed from earlier regional competitions, and are the world's finest young HPC experts. Just being there was an amazing accomplishment. And these young people were obviously thrilled to be there. 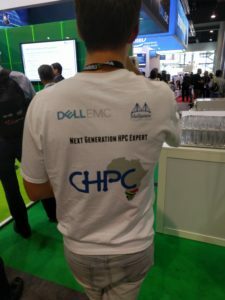 Each team had hardware that had been sponsored by major HPC vendors. I talked with several of the teams about this. The UPC Thunderchip team, from Barcelona Tech, (Winner of the Fan Favorite award!) 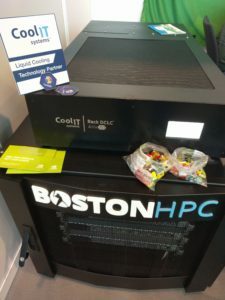 said that their hardware, for example, had been donated by (among other vendors) CoolIT systems, who had donated the liquid cooling system that sat atop their rack. Over the course of the week, these teams were given a variety of data challenges. Some of them, they knew ahead of time and had optimized for. Others were surprise challenges, which they had to optimize for on the fly. While the jobs were running, the students roamed the show floor, talking with vendors, and, I'm sure, making contacts that will be beneficial in their future careers. Now, granted, I had a bit of a ulterior motive. I was trying to find out the role that CentOS plays in this space. And, as I mentioned in my earlier post, 8 of the 11 teams were running CentOS. (One - University of Hamburg - was running Fedora. Two - NorthEast/Purdue, and Barcelona Tech - were running Ubuntu) And teams that placed first, second, and third in the competition - (First place: Tsinghua University, Beijing. Second place: Centre for High Performance Computing South Africa. Third place: Beihang University, Beijing.) - were also running CentOS. And many of the research organizations I talked to were also running CentOS on their HPC clusters. I ended up doing interviews with just two of the teams, about their hardware, and what tests that they had to complete on them to win the contest. You can see those on my YouTube channel, HERE and HERE. At the end, while just three teams walked away with the trophies, all of these students had an amazing opportunity. I was so impressed with their professionalism, as well as their brilliance. And good luck to the teams who have been invited to the upcoming competition in Denver. I hope I'll be able to observe that one, too!